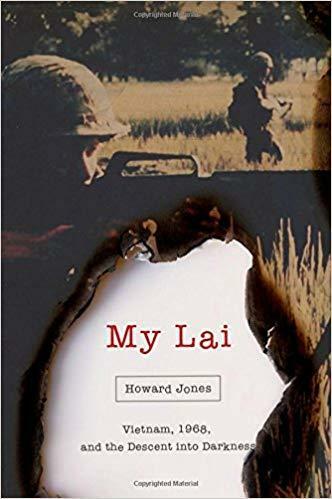 There have been, over the years, many books and articles written about the My Lai Massacre and Lieutenant William Calley, from the earliest coverage by Seymour Hersch and Alabama writer Wayne Greenhaw through dozens of others, narrow or broad. After this astonishing, brilliant treatment, there will never need to be another study of My Lai. There can be little more to learn. Reading tens of thousands of pages of testimony, transcripts and official documents, including transcripts of interviews with Vietnamese survivors of the massacre, Alabama historian Howard Jones has devoted ten years to the examination of what happened at My Lai, why it happened, how it was essentially covered up, and why there was almost no punishment delivered to the soldiers who murdered about 500 civilians, most of them women and children, in cold blood. There is no possible excuse for why three platoons of regular young American men lost their moral compass and became killers that morning, but there were events and conditions that helped make the moment. The men, the “grunts,” were mainly draftees, poorly trained, and had never been in battle. In the early months of 1968, Charlie Company had suffered nearly thirty casualties, men killed and wounded from land mines, booby traps and snipers. They had never engaged or even seen the enemy. On a mid-January night, on patrol in the jungle, they were forced to listen to the screams of a captured American soldier being skinned alive by the Viet Cong. These men were scared, angry and primed for revenge. On March 16, when they entered the My Lai area, known as Pinkville, chaos broke loose quickly. They had been told that only Viet Cong would be present, with civilian villagers gone to market. Instead, there were no young men present, only old men, women of all ages, and children, including fifty children three years old or younger, many babies in arms. Jones has, meticulously, put together a minute-by-minute account of the rampage: the rapes, and the killing by bayonet, grenade, pistol, and automatic fire. It was a blood bath. Civilians were shot in the road, in a ditch, kneeling and begging or, rarely, on the run. It’s tough, painful reading and hard to believe, but one does. Jones describes at length the intervention of Warrant Officer Hugh Thompson, a helicopter pilot, and others. They saw what was happening, landed, and, horrified, protected some civilians even against their fellow Americans, and then reported the incident. These few were the heroes of the day. As news spread of the killings, there was an elaborate cover-up, laid out in detail here, but finally only Lt. Calley was declared guilty of a crime. And even then, about half of Americans thought he was a hero, or just following orders. “My name is William Calley. I’m a soldier of this land. I’ve tried to do my duty and to gain the upper hand. But they’ve made me out a villain, they have stamped me with a brand. Although My Lai further energized the anti-war movement, even much of the American left objected to punishing Calley, on the grounds that he was a scapegoat and senior officers were not being held responsible. Was My Lai a turning point? Lesson learned? New rules of engagement in place? Jones’ brief summary of the events at Abu Ghraib prison in Iraq suggests not. Under the right conditions, it seems, almost anyone is capable of almost anything.